We have seen the future and we are publishing it in GenealogyBank today. 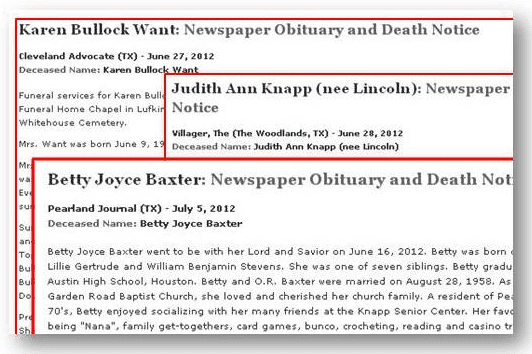 Did you realize that GenealogyBank actually includes obituaries that will appear in tomorrow’s and next week’s newspapers? Along with digitizing historical newspapers, we work closely with newspapers currently publishing. Thousands of newspapers around the country are preparing their copy for tomorrow’s or next week’s issue. As they send their electronic feed to lay out these upcoming issues of their newspapers, they simultaneously send that feed to us and we add it immediately to GenealogyBank. So that is why you will see obituaries here that have not actually been printed on paper yet. Here are just three of the thousands of obituaries that will be published in newspapers in the coming weeks—but already appear online in GenealogyBank today. Our Acquisitions and Tech Teams are working every day to secure more newspapers to add to our burgeoning online archives. Once a newspaper is selected to be part of our newspaper archives, we work to secure a complete back-run of every available issue of that newspaper. Tracking down every newspaper issue and making sure that it is the best possible copy so that it can be digitized and added to GenealogyBank can take time—often years. Even when there are still some issues missing from a newspaper title, we will launch that title so that researchers will have the benefit of access to millions more articles about their ancestors. After launching a title, we continue our search for back issues to add. Every day we add new newspaper titles and fill in gaps for our existing titles, updating and filling in missing issues or adding more obituaries to over 2,900 newspapers a month. In July we will be adding the obituaries from seven more newspapers from Maryland, Massachusetts and Michigan. These obituaries will be in our Recent Obituaries collection. GenealogyBank provides genealogists with the most current and most comprehensive online source for newspapers. Find your recently deceased relatives’ obituaries in our online obituary archives today!